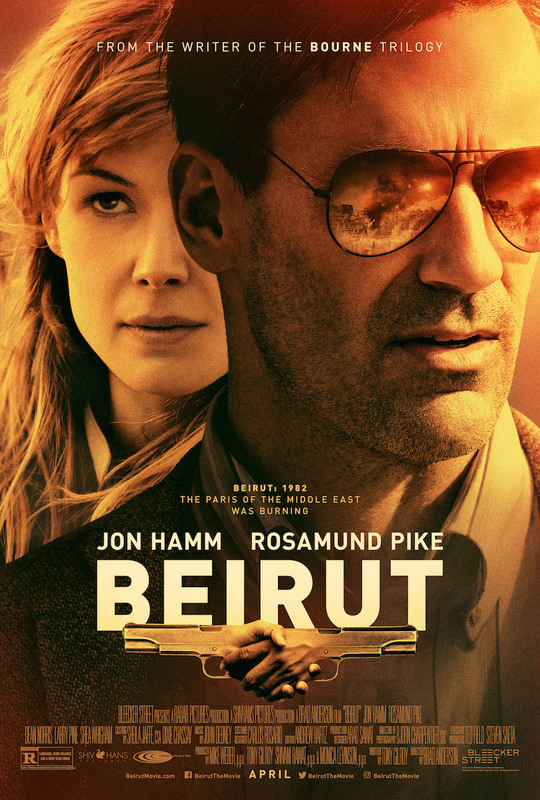 Beirut tells the story of a U.S. diplomat who flees Lebanon in 1972 after the tragic death of his wife in a terror attack. About ten years later, he is called back to Beirut by CIA operatives to negotiate for the life of a friend he left behind. The film stars Golden Globe and Emmy winner Jon Hamm and Academy Award nominee Rosamund Pike, as well as Boardwalk Empire’s Shea Whigham and Breaking Bad’s Dean Norris. Oscar-nominated Michael Clayton and Rogue One scribe Tony Gilroy wrote the script, with Brad Anderson (The Machinist) handling directorial duties. Beirut comes from Bleecker Street Media, the studio behind Logan Lucky, Megan Leavy, The Lost City of Z and more. Beirut is one of the two films Bleecker Street will premiere at Sundance this year, the other film being What They Had, starring Hilary Swank and Michael Shannon. Beirut hits theaters on April 13. Watch the trailer above, and see the film’s poster below.